You know that plastic, which is made from oil or natural gas, is bad for the environment. But did you know that 11% of household waste is plastic? Americans use 100 billion plastic bags each year — and it takes one plastic bag 1,000 years to degrade! You’re probably already aware that toting your reusable grocery bags when shopping helps reduce plastic waste — especially since on average one family uses 60 plastic bags in just four trips to the grocery store! You’ re likely already in the habit of bringing your own reusable water bottles everywhere you go, too. Keep up the good work, because in 2011 Americans bought 9.1 billion gallons of single use plastic water bottles. But our plastic consumption isn’t limited to grocery bags and water bottles, so this Earth Day, pledge to reduce your plastic footprint as a family. 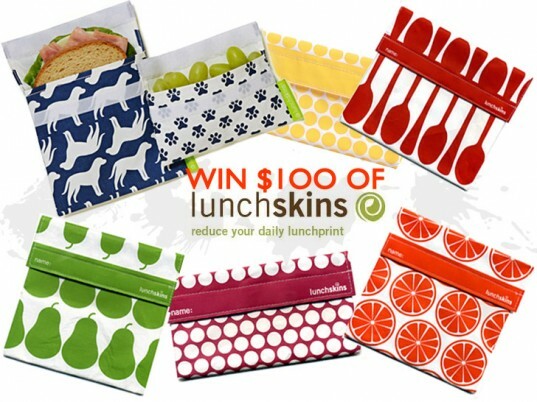 Keep reading to discover nine ways to say goodbye to plastic in your daily life, and to enter to win $100 worth of plastic-saving products from LunchSkins! 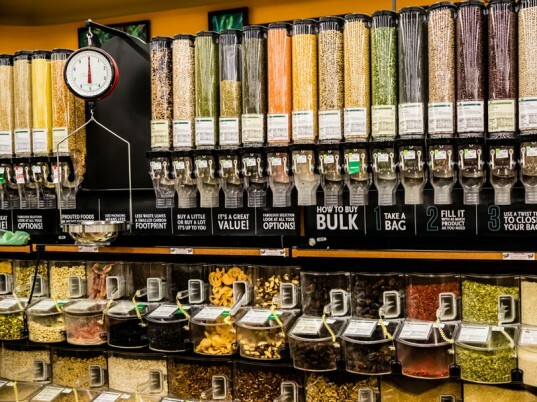 If your family eats a lot of nuts and granola you may already be buying those items in bulk; but don’t forget that you can find stores that serve up other items in bulk too, including rice, beans and pasta. Buying in bulk eliminates the use of wasteful, superfluous packaging. If you don’t have one already, creating a compost pile can help reduce your household waste, and in turn, the number of plastic garbage bags you use. Everything from food waste and pizza boxes to Fido’s hairballs and dryer lint can be composted. Bonus: Now you’ve got great fertilizer for your garden. Roughly 20 million sandwich bags are dumped into landfills daily. Do your part to reduce that staggering number by packing waste-free lunches for your kids. Buy a waste-free lunch kit for your kiddo that includes everything they need: a lunch box, water bottle, utensils, sandwich containers, snack containers and so on. Or, if your kid already has a bag or box, you just need to buy the containers to pack up his food. You can find cloth baggies from companies like LunchSkins, stainless steel divided dishes from Innobaby and glass containers from Wean Green for example. There’s no reason to stop at waste-free lunches either. Anytime you would reach for a plastic baggie or Ziploc, there is plastic free solution you could opt for instead — whether it’s a reusable cloth baggie or a small glass container. Still using plastic Tupperware to package leftovers? There are plenty of great glass options available. We love Wean Green‘s offerings, sized for everything from snack portions to baby food portions, but there are lots of other brands making glass containers that are great for leftovers too. Beyond saving extras at home, you can use glass or stainless steel containers to bring home take out or pack up restaurant leftovers. When it comes to disposable diapers, you hear a lot about how many are piling up in landfills — 7.6 billion pounds a year according to the Environmental Protection Agency (EPA). But you should also consider how much plastic is used to manufacture diapers. For babies in America alone, 80,000 pounds of plastic are needed to produce the number of disposable diapers used annually. Now with amazing hybrid diapers like those from gDiapers and Charlie Banana, green diapering couldn’t be easier. According to Be Straw Free, 500 million plastic straws are used in the US daily, which is enough to fill 127 school buses a day! 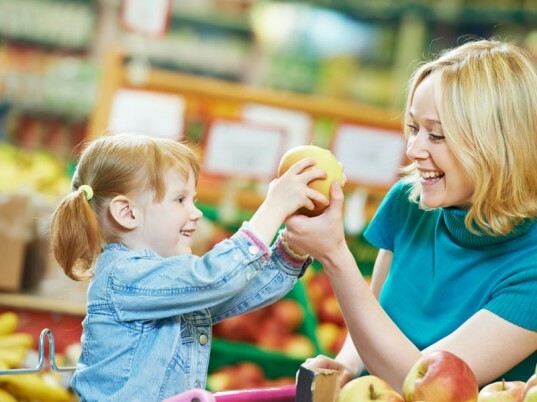 Buy cups with straws built in, encourage your kids to drink from their reusable water bottles or opt for reusable metal straws. Dining out? Bring your own reusable straw and let your server know you don’t need one. You started bringing your own grocery bags to the market years ago, but do you still come home with a gaggle of those thin plastic produce bags? They aren’t going to biodegrade anytime soon either. Bring home your fruits and veggies bag-less, or opt for cotton or string produce bags instead. Better yet, shop at the farmer’s market, or join a CSA, where your goods aren’t likely to be packaged in plastic boxes either. Whether you’re buying milk, chips, coffee, peanut butter, laundry detergent or personal care products, look at the packaging. When possible, choose cardboard containers over plastic ones since they’re easier to recycle and don’t require the same fossil fuels to create. If you’ve kicked the bottled water habit, that’s great, but if you’re still drinking juice, soda, coconut water or other single use beverages, take a look at the containers you’re sipping from. Try to skip all plastic beverage bottles and opt for ones packaged in easier-to-recycle glass instead. Coffee cups are culprits too, even the cardboard kind because they usually come with plastic lids. Go lid-less or bring your own mug for your favorite shop to fill. Win a $100 Prize Pack from LunchSkins! This post is sponsored by LunchSkins and they’re generously giving away a $100 prize pack to help you reduce your plastic use. One lucky winner will receive $100 worth of LunchSkins products including sandwich bags, snack bags, sub bags and LunchSkins 2 packs, which are available at Target stores. The bags are made from the same material as pastry bags and can be washed easily in the dishwasher. 2) Like Inhabitots on Facebook, and Follow Inhabitots on Twitter. For extra karma, like LunchSkins on Facebook and follow LunchSkins on Twitter. 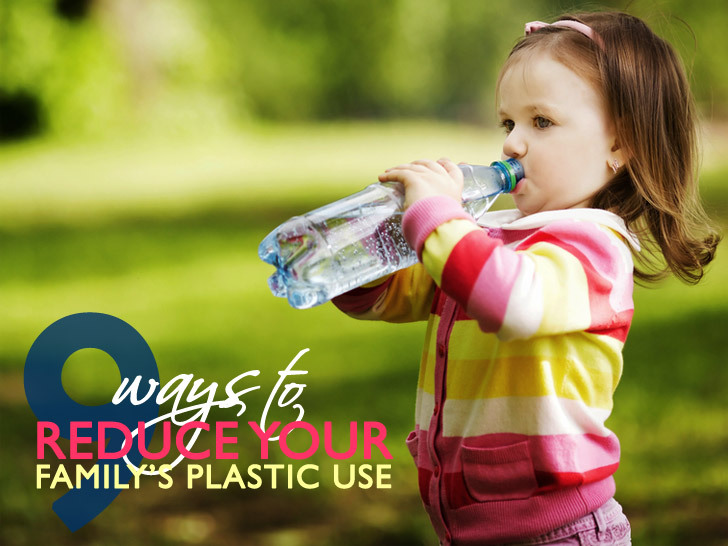 3) Add a comment to this post with your answer to the following question: How does your family reduce plastic use? Contest ends Sunday, May 5th, 2013 at 11:59 p.m. EST. Winner will be announced in our newsletter on Friday, May, 10th 2013. Good luck! Our family is learning to use cloth napkins instead of purchasing paper napkins. They've enjoyed picking out fun fabrics. My family is learning to use cloth napkins instead of paper. We've enjoyed picking out fun fabrics to create our own. Now onto other changes. I second the using cloth napkins! My family is making their own yogurt...I store it in glass containers instead of plastic of course and besides the plastic container that the starter yogurt came in that is all the plastic used. We have started using more glass jars for food storage, and recycle the drink and food containers we use for school lunches by reusing them over and over. We don't drink soda and use a glass pitcher for beverages we make ourselves. Buying in bulk helps reduce packaged items we buy a lot like oatmeal, rice, and nuts, which we store in recycled glass containers. We bring our own cloth bags for grocery shopping, String bags for farmer markets, and reusable water bottles. Our family uses Klean Kanteens instead of plastic water bottles - even the 4 year old (and he has since he was able to use a cup)! We use glass containers for leftovers. We use glass containers for leftovers and never buy/use plastic water bottles. I re-use all containers as much as possible (instead of buying fashionable new options), e.g. I am using take-out plastic containers (which I had anyway) as tupperware. I also use my own bags for grocery shopping. We use reusable containers instead of plastic baggies, Bring our own coffee mugs when we buy coffee and recycle everything we possibly can! We try to use as little plastic and disposable items as possible. We use cloth diapers, cloth diaper pail liner, reusable grocery bags, and reusable snack bags. I've reduced plastic use in the household by using glass containers instead of plastic ziplock bags, I use leftovers, from juicing veggies, to use in broths so I don't have to buy broths contained in packaging that uses plastics such as lined cans and boxed broths. I also switched to a CSA that packs the veggies in recycled paper and reusable crates which dramatically reduces plastic packaging. Composting or using veggie scraps, in broth also dramatically reduces the use of trash bags. My and my child's lunchs are packed with reusable cloth bags, and glass or steel containers (glass is not permitted at my child's school ). Also any plastic items that can be safely reused are plastic water bottles make great percussion instruments or fruit fly traps and can be used in a variety of crafts. Plastic bags can be used to make rugs or place mats with a little bit of weaving or crochet knowledge. We have switched to cloth napkins and microfiber towels, class storage containers... we make our own laundry soap and household cleaners and dry our clothes outdoors. When we do use the dryer we use foil balls in place of dryer sheets. We grow as much of our own food as we can find space for. We very rarely buy anything in a plastic bottle and recycle or repurpose anything we can. We buy used clothing and repurpose old, unwearable clothing into cleaning cloths and craft projects and such. We make our own cloth sanitary pads and cloth diaper our babies. One thing I need to get better at is remembering my own bags at the produce market... for some reason it just always slips my mind! We love to use reusable baggies for snacks on the road. My family reduces plastic use by not buying them to begin with. Making sure to recycle plastic when necessary. If not, reuse. We use reusable water bottles and refill our 5 gallon jugs instead of buying bottled water. We also use reusable bags instead of the plastic bags that are used in the stores. We use reusable water bottles and refill our 5 gallon bottles instead of buying bottled water. We also pack waste free lunches and use usable shopping bags. We wash and reuse plastic baggies. Oops! Go small footprint with large environmental impact! At home, we use cloth napkins, gDiapers, and recycle glass jars for canning. On the go, we have travel mugs and a reusable coffee sleeve (who knew!). LunchSkins would be a great addition! In the garden, we used recyclable or reusable containers to sprout seeds. Go small footprint with a large environmental impact! We don't use disposable plastic bags at all. It can be tricky at times, but very worth it. We're not using plastic grocery bags, and just got mesh bags for the produce section, too! Next up is eliminating plastic bags and containers from our lunchboxes. I use cloth towels to dry off hands especially in the kitchen. On a canal boat cruise, we had a designated napkin for 5 days and just kept turning it around to find a clean spot. When we use a plastic bag to buy things in bulk from the store, we wash it out & re-use it next time we're there. Our family reduces our plastic use with re-usable straws and water bottles, paper and re-usable bags and will be using cloth diapers when our bundle arrives soon. we reuse the plastic containers we do get to make planters for growing small plants and water toys for the bath tub or pool in the summer. We use reusable grocery bags at the store but when we do get the plastic ones we use them to line our trash cans at home or find other ways instead of throwing them away! We use organic, fairtrade and reusable shopping bags instead of buying new plastic bags all the time. We have also stopped using plastic bottles, instead we use eco-friendly bottle made out of stainless steel. We have cut down on plastic use in our home by purchasing products in bulk with a reusable container whenever possible. We recycle the containers from take out to send school snacks or store leftovers, and currently is housing a 'pet' snail my daughter found. We only use 100% recycled garbage bags and we always bring our own bags shopping, even to the mall. The store bought eggs I prefer come in plastic packaging, but it is recycled from water bottles, and we reuse them to pick up fresh eggs from a local farm when available. My daughters school has a program for healthy snacks, composing and less waste which the kids get points and Lunch Skins would be a great addition to what we are already doing. We save and reuse all glass jars, drink out of refillable metal bottles, shop at the local food co-op where you bring all your own reusable bags and try and buy mostly wood toys! We recently bought some ecolunchboxes for my husband to bring his lunch to work instead of using plastic tupperware. I think the best one is that we bring our own fabric shopping/grocery bag and in summer we use a soft cooler bag that was a handmedown. Sometimes we forget the bag and then we just carry things by hand or by rolling up the hem of a shirt and using it as a pouch. We always say at the register "no bag please", meaning no plastic bags for us and I don't care if I am being looked funny for saying that. And if we have plastic film from food wrappings we collect and recycle it, but we tend to buy in bulk and avoid plastic as much as we can anyways. We also reuse smaller paper bags (from flour etc.) as lunchkins if we get any. And we have glass containers for food storage that are reusable and metal and glass water bottles that we take with us. Unfortunately we haven't been able to eliminate plastics all together, but we try. We use glass canning jars for storing food at home, and glass containers that fit into our lunch bags for dining out of the house. We use very little plastic, from using all bottles and leftover boxes in glass to all reusable shopping bags. We have a compost and always buy in bulk. I have to say the hardest is when you need something really light and thin to pack just a sandwich in, that's where I feel I need to improve by getting rid if zip locks. We always use cloth bags for purchases, we use glass storage containers and reusable PBA free water bottles. We also use BioBags for all our trash cans, and yard clippings when there is too much for our yard and compost bin. We also take our own tupperware to restaurants when we suspect that we might have leftovers. And when plastic does sneak it's way into my life, I recycle it if at all possible. I do really wish I could eliminate plastic used when collecting bulk goods and vegetables, why don't the stores sell cloth bags for this and have a weight reduction upon purchase! I use glass jars to store food in. It keeps food fresh longer and it don't get that funkey taste you get from plastic.